Brisbane’s seniors will receive free off-peak public transport if Labor wins the March 2012 Brisbane City Council elections, the party’s candidate has promised. It will cover free public transport on buses, CityCats and CityFerries between 9am and 3.30pm Monday to Friday and all day on Saturday and Sunday. Labor will fund their $5.7 million annual policy from Brisbane City Council’s public transport budget and make quarterly payments to TransLink, the State Government body which co-ordinates public transport. Labor insists that even though there are 100,000 Brisbane seniors, statistics show only 27,000 had used council buses and 2900 had used CityCats and CityFerries in the past 90 days. 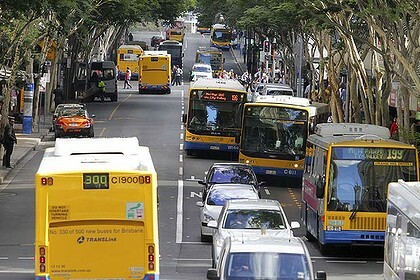 Brisbane City Council allocated $465 million for public transport this financial year, however fares paid by customers using Brisbane City Council buses, CityCats and CityFerries go to Translink. Labor’s mayoral candidate Ray Smith said he wanted to reduce costs for seniors and ease traffic congestion. He launched his policy on the eve of Senior’s Week. ‘‘This is free public transport off peak on our CityCats, on our ferries and on our Brisbane City Council buses,’’ Mr Smith said. The scheme would operate through Go Cards, he said, or via a paper ticket if seniors did not have a Go Card. ‘‘Senior residents in Brisbane will be able to register their Go Card online and that will enable them to avail themselves of Brisbane’s free public transport,’’ Mr Smith said. It would start ‘‘as soon as practicable’’ if Labor wins the 2012 election, he said. Mr Smith said Labor believed the Liberal National Party administration was emphasising expenditure on toll tunnels over public transport, despite the LNP pushing for Go Cards to be placed on CityCats. Today he accused the LNP of reducing public transport by $38 million over the past two budgets. However Councillor Julian Simmonds, the LNP’s public transport committee chair, said Labor’s promise neeeded further scrutiny. He said the issue depended on TransLink’s response. ‘‘If the State Government are willing to waive the fare revenue that they receive to allow pensioners to travel for free I will absolutely support it,’’ Cr Simmond said. Labor’s policy promises to make quarterly payments to TransLink to cover the lost fares. ‘‘Our policy has been accurately costed,” Mr Smith said. Brisbane’s senior citizens already receive a 50 per cent discount on public transport using their Seniors Card. Cr Simmonds said there was a lot of detail to be examined and Mr Smith’s proposed policy did not add up. ‘‘[On] 100,000 seniors in the city, at $1.33 – the average two-zone trip – a return journey once a week – that is already $14 million on the buses alone,’’ he said. However Mr Smith said Cr Simmonds was wrong to assume all seniors used public transport. Bulimba resident and senior Fay Taylor said she caught a bus ‘‘three to four times’’ a week to the CBD, to Cannon Hill and Carindale Shoppingtown.